IS THIS THE most Irish story of all-time? 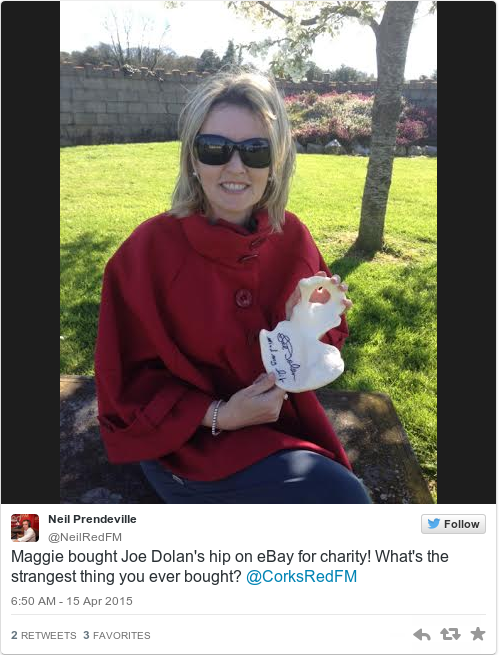 Yesterday on Red FM’s Neil Prendeville Show, a woman named Maggie called in to regale the country with the tale of how she bought Joe Dolan’s hip bone on eBay. Maggie explained that the hip bone had been heavily featured on Podge and Rodge prior to his hip replacement. Dolan later agreed to sell it as part of a charity auction organised by Keith Duffy in aid of autism. A longtime fan of the late singer, Maggie paid €650 for the hip bone. He later signed it, “Mind my hip, Joe Dolan”. It started out at something, like, €50 and it went all the way to €650. It was the only body part ever sold on eBay and they have a thing put down now that it can never again happen. Where does she keep it? Encased in bubble wrap, of course. So, to recap: a woman owns Joe Dolan’s hip bone and it’s the only body part to ever be sold on eBay. As you might expect, the newspapers are rather enjoying the story and it’s lent itself to some fairly decent puns. You can listen to the interview on Red FM here.